As well as having one of the best opening lines, Quesadillas, Juan Pablo Villalobos’s second novel, carries on the themes of his novella, Down The Rabbit Hole. * In this thought-provoking novel, Villalobos explores the corruption and inflation of Mexico using the fury of a child’s perspective, who is struggling to find his own way in the world. At times our narrator’s frustrations echo those of Mexico but Villalobos makes sure the book isn’t too serious by throwing in plenty of comic moments. Our narrator, Orestes, lives with his parents (his father, a teacher, has a soft spot for Greek names) and his six siblings in a run down house, on a hill, just outside the town, watching the volatile political situation of their village, at arm’s length. Through out the story, Orestes is obsessed with his family’s place in society and is always asking – are we poor? The preoccupation with the delicate Mexican economy and society is reflected early on in the novel in Villalobos’s great style of serious with a huge dollop of dark comedy by the quesadillas Orestes mother cooks on a daily basis. 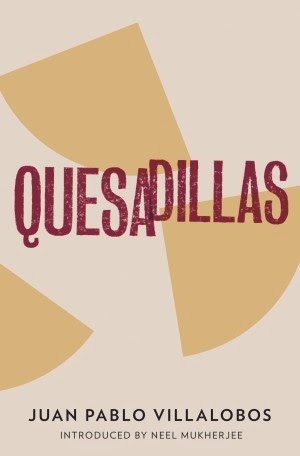 The inflationary quesadillas bulge with food as the mother panic buys food when price increases are announced while the poor man’s quesadilla just had the word ‘cheese’ written inside them. Villalobos captures the build up of rage and the need for independence of a teenage boy beautifully. Orestes wants to escape the constraints of society but he also wants to know where his place in society should be. Along the way, the story becomes more absurd, two of his siblings, ‘the twins who are not twins’ go missing in a supermarket, Orestes goes with his brother to a mountain, convinced they have been abducted by aliens and finally ends up in the city, having escaped his ‘boring’ life and tries to survive in the real world, pretending to fix electrical appliances in exchange for quesadillas. Finally, he returns home, ready for one last adventure with his family. Along his journey, Orestes must learn that politics doesn’t just happen on the television or in the city but also in his own family home. He wants to escape the normality of his life but in doing so the narrator realises that this notion does no exist. This coming of age novel fabulously explores the things we must do to survive and to protect the people around us. And that first line? Well, you’ll have to read it to find out.